Fenugreek has ben used as a medicine and a spice since ancient times. The Arabs roast the seedsd and use them as a kind of “coffee”. The therapeutic properties of are recommended for depression and sweating in menopausal women and impotence in men. It has an excellent reputation for increasing the milk flow in mothers. An excellent source of vitamins and minerals, in particular, calcium (which is important for women after menopause). 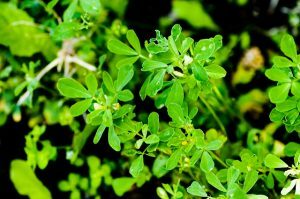 Fenugreek is a soothing remedy for bronchitis and pulverised seeds make an excellent poultice for rheumatic pains or boils which benefit from it’s “drawing” power. Active Constituents: Alkaloids (trigonelline, choline, gentianine, carpaine), steroidal saponins (mainly diosgenin), flavonoids, oils (up to 30%), protein (up to 20%), Vitamins A, B, C, Calcium, Iron and other minerals. Contraindications: Fenugreek has a stimulating effect on the uterus and should not be used as a medicine during pregnancy.